The following is a city set in the world of Powers & Perils. The country of Donara was first introduced in "Travels Through Donara" in Heroes #1. Now Richard Snider takes us deeper with a description of the capital city. WEP. 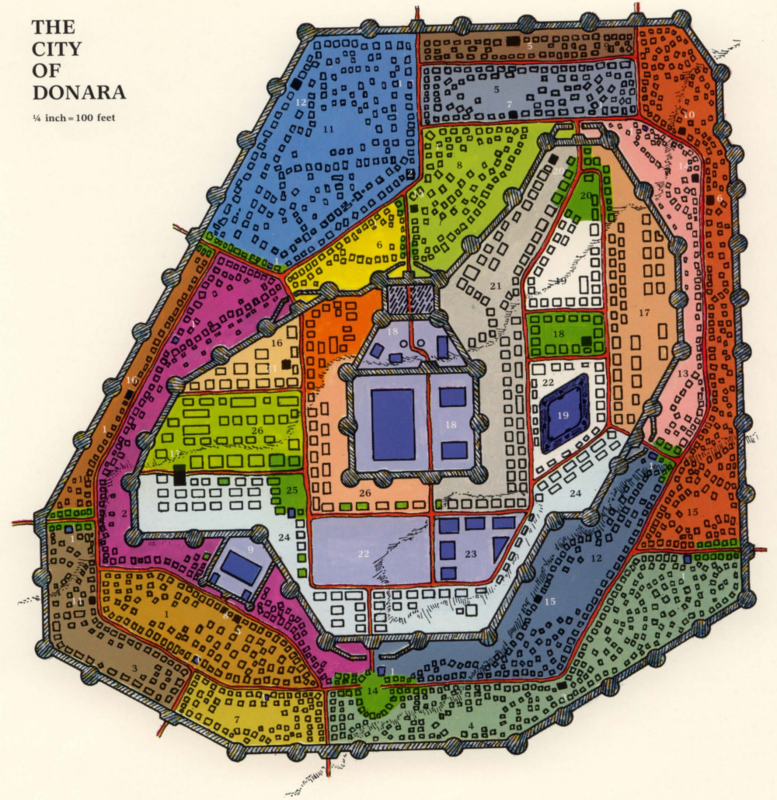 The city of Donara was founded by Don II (897SA). It was built to serve as the royal city of the Donaran kings. Its initial inhabitants were the personal host of Don II, Salaqi slaves and those E'lici commoners compelled to move to the new city. Upon its completion in 910SA, it had become a thriving city with is population of more than 20,000 persons. In the 200 years since its construction the city's population has nearly doubled and it has taken is schizophrenic character. The Inner City is the dwelling of Donaran citizens and wealthy people. It is beautifully designed, placid area catering exclusively to the elite. Donara's Outer City is, in the words of a Caldan merchant: "a festering boil on the face of a land that is unfit for human occupation." In most places, its citizens face a day-to-day struggle to survive. Living conditions are miserable an disease, crime and hostility towards the wealthy are almost endemic. This article will detail the major areas, places of interest and important citizens of this city of contrasts. Due to space considerations, only the most general details about the city are included. The city's population is 35,00, of which 12,000 reside in the Inner City and the rest in the Outer. The outer limit of he city is its outer wall. The dividing line between the Inner City and the Outer City is the Inner Wall, which can only be passed through by way of its bastions (unless one has knowledge of the sewers). The palace compound is separated from the Inner City by its own walls and bastion This compound can only be reached from the Outer City through the bastion. Residents of the Inner City can enter through its southern gatehouse and postern gates in the east and west middle towers. Under the current ruler, Don XII, the city is purposefully kept divided. Access to the Inner City is restricted to residents of the Outer City and non-Donaran citizens. The walls of the Inner City and the Palace are heavily guarded, more so than the outer Wall. Entry into the Inner City without due cause or permission of the garrison is punishable by 30 days in Prison Donya. The penalty for forced entry into the palace is 2 years. Functionally Outer and Inner Donara are two cities. Outer Donara is a poor area kept under control by force. Each neighborhood has at least one garrison post that serves the soldiers who patrol (in four-man units) during the day. At night, the guards stay in their barracks except for eight-man raids launched against places on the advice of informants. Inner Donara is much different. Garrison members are from the royal guard and patrol singly (except in the Boil, where two-men patrols are common). Because of the elite station and general wealth of th people crime is rare. The atmosphere is placid genteel and civilized at all times. The citizens take great pride in this. Neighborhood associations hire armed guardsmen to ensure that this climate of peace continues. They are supported by wealthy citizens contributions for local businesses and a small stipend from the crown. Due to the tense situation, Don XII's New Year Edict of 1098SA banned the possession and use of 'heavy weapons" by any citizen within the walls of he city. This means that no person may enter Donara wearing, or carrying in an accessible position, any weapons that have a WSB of 1 or more. Those who do so ordered to give up the weapon until they leave the city. They are given a receipt to redeem it when they leave. A refusal is punishable by 90 days in Prison Donya plus any criminal sentence resulting from using that weapon. NOTE - This law is obligatory on persons with a station of 3 or less. Persons with a higher statoin, are expected to voluntarily abide by it but cannot be compelled to do so. Refusal is reported to the Royal Guard. In determining station, barbarian station has no value, and a non-Donaran station is considered to be one less than it is. Therefore, a barbarian warchief must surrender his battle axe as would a Caldan with a station of 4. The common weapons in Donara are swords, daggers and light weapons. Missile weapons, shields and heavy (AV2+) armor are frowned upon by the garrison. Those that wear or carry them will be suspected ando possibly harassed. The sections that follow detail the neighborhoods of the Inner and Outer City in alphabetical order. The Boil is the only "poor" district within the walls of the Inner City, The residents are tradesmen, servants of the wealthy, entertainers and artisans. The majority of the residences are owned and rented from Mavinius Arda. He also owns Spinner's Bar, a common inn serving as his land office. The manager (his nephew) is landlord to more than half the people in the Boil. The residents are businessmen, people working in the Royal Diamond as functionaries and members of the city garrison. It is a quiet, wwll-patrolled area with a strong, professional neighborhood association. Most of the guards employed by the association are also members of the Royal Army or the garrison. The are used in dealing with unsavory people. One of the city is major markets selling clothing, food, drink and luxury items. A great deal of trade comes from patrons of the Royal Diamond and residents of East Hill and Silver Lane. This area contains guild halls and the residences of important artisans and craftsmen who are guild members. It does not have the unity of the other areas, but is heavily patrolled by guards from the guilds. Each guild has its own guard, but the neighborhood does not have an overall association. The major guilds in Guild Court are the jewelers, carpenters, glassworkers and the armorers. They dominate the neighborhood and together own more than 80% of North Market. Of the four the armorers are the most powerful; their Guildmaster is an old, venal and corrupt man who has dealt with unsavory people like Urzal Kesh and Shaikeir the Vendor. The lion's share of the market is controlled by the guilds, and contains jewelry shops, armorer's forges, glass sellers and carpentry shops. Other fine trades are also represented including a few artists, stoneworkers and vintners. No food animals or crude goods are available. It is patrolled by the guards of the Guild Court district. The Silver Lane district east and south of the palace, is occupied by wealthy commoners, military officers, government officials and other citizens of this nature. It is a residential area for the middle to low-level elite. Its association is controlled by General Jobar Nels, commander of the Royal Foot Guard and Baronet of Nelsara (located 30 miles to the west). Its guards are seldom seen, but they can appear in force and are well-organized when needed. Through Nels, Silver Lane hires an elite company of the Foot Guard to watch their neighborhood. This is known in the city and few choose to risk facing the guardsmen of Silver Lane. The area around the Royal Diamond. The residents are all gladiators, employees, and owners of this monumental coliseum. Day-to-day life revolves around the Diamond. On event days (Monday, Thursday and Saturday), Stadara is crawling with people from the Inner City. Herein lies the wealth of the district. NOTE - The principal owners of the Royal Diamond are the royal family of Donara (60%), Mavinius Arda (10%), Duke Salin of Pelara (3%), the Count of Mordara (2%), its manager Krisan Toba (1%) and ten other investors (14%). This area is exclusively devoted to the approved religion of Donara. It contains temples, nunneries and monasteries. The major edifice is the temple of Ashur (God of Storms, Lord of War) who is Donara's major god. Other temples are devoted to Enki, Inanna, Vahagn and other lawful gods. At the apex of the hill, in a large courtyard surrounded by the temples, is a large statue of Ashur that looks out to the south. NOTE - The leaders of the faith are powerful. Unlike other cities, they have complete royal authority to try crimes of heresy in their courts. This supersedes the city's justice system and is beyond the purview of the King. This power is allowed them is because the King is a devoutly religious follower of Ashur, and the High Priest of Ashur is a persuasive and charismatic man. The residents represent the noble elite of the nation. Most of the major noble houses have manors in this area. It is also home to Donara's major military leaders, wealthiest merchants, and famous artisans. It is heavily-patrolled by an elite, active, and well-paid association composed of some of the western world's finest mercenaries. The most famous resident is Mavinius Arda, all old man who has risen to become the richest man in Donara. His personal wealth exceeds the King, Duke Salin of Pelara, and other noblemen. As a commoner, he is looked down on by his noble neighbors, but his wealth gives him his status and position. This market contains a little bit of everything. It is owned by Mavinius Arda, who rents space to any merchant whose craft is not already represented. Rent is high, but each merchant has a monoply on the goods of his trade. Customers must deal with him or be forced to look in another market The market is patrolled and regulated by seven skilled mercenaries. Each is a highly respected fighter with total loyalty to Mavinius Arda: they are paid ten times the standard rate for mercenaries. This neighborhood got its name from Prince Xalan of Xalanara the leader of a famous charge that shattered the flank of a Salaqi army and won the day for the Donarans in 986SA. Most of its residents are husbandmen, hostelers and merchants dealing in animal or travel-related goods. Others who live here are government officials, members of the Royal Horse Guard and private citizens who have a liking for horses and other animals. Arrowshot is a poor district outside of Prison Donya. The majority are poor Donarans and people emplyed by the prison. It is one of the quietest neighborhoods in the city, and one of the most hated. Its citizens keep to themselves and avoid going into the more dangerous areas of the Outer City. A non-descript area full of private residences, mostly owned by simple peasants, laborers and caravan guards. As there is little wealth, and its citizens are not exceptionally hostile, it is one of the safest neighborhoods in the outer City. Problems do come in from Rabbit's Run and the Salaqona Quarter. The residents of Craft Street are skilled and semi-skilled artisans and laborers. A large number of potters, cobblers and other tradesmen live here. It is also the home of wagering parlors, criminal activity, and smuggling. Beneath the veneer of a respectable impoverished peasant district, Craft Street is an active place where anything can be had for the right price. The Filmark district is the residence of laborers and other unskilled workers. Though not the most dangerous part of the city, it is a rowdy neighborhood where disputes are solved violently (more because of their environment than innate evil or criminality). They tend to be honest, hard-working people who are prone to commit acts of violence when pressed. This area is inhabited by the destitute people with no source of income who cannot or will not work. It is the filthiest part of Donara, abounding with beggars, cutpurses and other disreputable characters. A rich man entering this area unarmed or without a guard would be exceptionally foolhardy. On the other hand, since both legitimate and illegitimate authorities shun it, Forgotten Valley is a good place to hide no matter who might be looking. This is easily done if you can make a deal with Marla Bol, "the Queen of Forgotten Valley." The wealthiest men in the Outer City live in this small triangle of buildings. They employ a large band of thugs and enforcers to protect their dwellings. These guardsmen operate mostly at night because they do not have the support of the crown. Any known thief or disreputable foreigner that they chance upon is beaten severely. Anyone caught performing a criminal act is killed. They are a sadistic group operating as hired vigilantes. Most of them are residents of the Pesthole and Palisar. The people of Maulton are soldiers, laborers, construction workers, and blacksmiths. They are a sullen, burly lot who don't take anything from anyone. Except for occasional brawls and violent occurences Maulton is a respectable neighborhood that has no time for its more disreputable neighbors. For a known thief or other felon to start trouble can he quite fatal. Morar the Smith is called upon for help when trouble comes. Palisar is a mercenary active and dangerous place. Most of it's citizens are people whose goal in life is to make enough money to move is into the Inner City. They are quite willing to do anything to achieve this goal. The residents cover a much wider spectrum of skills than what is found in other areas of the Salaqona quarter. But whatever skill they have, most are untrustworthy and dangerous towards anyone they do not support or fear. A descriptive name: almost without exception, the residents are criminals who owe allegiance to the Thieves Guild, Urzal Kesh, or some other group. Most live through cunning or force as con-men, thugs, thieves or smugglers. For the unwary, Pesthole can be an ultimate and final adventure. This narrow stretch is the personal ''fief'' of the most wanted felon in Donara: a thief known only as "the Rabbit". No one has seen the Rabbit, yet his gang operates here and owes their allegiance to him. They know him as a sinister voice from the shadows or a hooded figure who sits in darkness. Anyone learning more about him is marked for murder. The citizens of the Run have the characteristics of both Craft Street and Crossroads. They are peasants, laborers, artisans and avowed criminals. A great majority of them are hostile towards the wealthy and consider the Rabbit to be a hero who valiantly opposes the wealthy for the good of the poor. This is the most clannish neighborhood in the Outer City. Its citizens are descendants of the Salaqi prisoners and slaves that were brought here in chains. No man of Donaran blood can walk this quarter safely at night The people are a hostile, sullen and vicious lot with a hearty hatred of their conquerors. On the Donaran side, the official government opinion of the Salaqi is that they are rebellious, stupid and lazy creatures who are not, and never will be as worthy as their Donaran masters. The lords of the city, with few exceptions (notably the current Crown Prince), consider this quarter to be a "reservation" where the Salaqi can be contained when their labor is not required for a demeaning or unsavory task. Most of the quarter's occupants are laborers for the Donarans. All have experience in dealing with the criminal element and support the growth of the Sea Star Society: a Salaqi secret society dedicated to overthrowing the Donarans and becoming independent. These are innocuous, poor and desperate peasants, unskilled workers and laborers who seldom find employment. Those who do find steady work eventually move to Filmark. Life in Shaded Valley is made difficult by two groups. The local group is "the Holy Society of Dark Vengeance." It is a chaos oriented orgiastic religeous cult working for the overthrow of the government desctuction of the lawful temples. Their base of operations is the Twisted Shade, the owner of which is the Grand Master of the order. The order sacrifices local citizens to dark gods as part of their rites. The other organisation terroizing the Shaded Valley is the Thieves Guild based in the Warren. Its thugs regularly move through the streest exacting tribute from its citizens. The Silken Ribbon is primarily noted for the entertainment a young man can find in its streets. A large large number of its citizens are craftsmen, clothworkers and artisans. Entrepreneurs in the Ribbon regularly associate with and pay the Thieves Guild for protection. A sprawling open market where all goods are poor and overproced. This is the only large market in the Outer City. Its merchants have a death grip on the needs of the city poor. Most of the merchants charge at least three times what an item is worth and will take every brass bit that they can get. As in most markets, prices are negotiable. The merchants start at triple the normal cost but can be talked down, after great complaints about the cruelty of the bargainer, to 1.5 or 2 times the item's value. This is the most wide-open, uncontrolled and dangerous area of the city. It is a maze of twisting alleys and narrow streets. It is controlled by the Thieves Guild. Its citizens are peasants. laborers, common artisans and criminals. Now that you are familiar with the basic environment of the city, the sections that follows detail important places that should be featured in any adventures conducted in Donara. They will be listed in the same manner used to detail the neighborhoods. The home and base of operations of Mavinius Arda is a large four-story manor house located at the end of Gold Street. The house proper is surrounded by a garden that is planted with flowers, grass and shade trees. The garden is surrounded by a ten-foot high, stone wall with watch towers in each corner. The normal residents of the manor are the Arda family (Mavinius, his wife, two sons and a daughter), 13 servants and 10 armed guards. Four large dogs also roam the grounds. They are Mavinius pets: double-size Dog III's trained to obey his order. The palace walls divide the compound into two sections. The small section contains official government buildings and a large barracks used by the Foot Guard. The large section contains the Royal Palace (the largest building in Donara at 400' x 250' feet) and two large barracks buildings used by the Horse Guards, elements of the Foot Guard, and other Royal army units. The original coliseum was a joint venture constructed in 1002SA by Mord III, Count of Mordara, and Don IV, King of Donara. Since Mord X took over, Mordara's share in the Diamond has decreased from its initial 40% to the present 2%. The Diamond is used to hold bi-yearly gladitorial contests staged by the royal family. There is also thrice-weekly afternoon battles featuring single combat, small melees and Donla competitions. It is a favorite place of the Donaran elite. NOTE - Donla is the national game of Donara. It is a cavalry competition between two 12-man teams. One team starts at each end of the field protecting a distinctive flag. Each team must attempt to take the enemy flag without losing their own. Neither team can move their own flag. If they recapture it they must take it back to the sconce it is set in. Donla is a blood sport. Contestants provide their own equipment: any weapons are allowed but lances, missile weapons or shields. Any man may strike any other man, any horse used to strike any horse or man. Any man who strikes a horse is removed from the game and fined the cost of that animal if it should die. If a man's horse falls, he may continue to fight on foot if he chooses to do so. It is also legal, if he can do it, for him to take a horse from an enemy rider. He may not ride double with a teammate or take a teammate's horse. In most Donla games the winnning team wins the arms and mounts of the losing team. It is a a expensive game engendering vociferious wagering and causing violoence among the audience. A great Donla player is almost a hero. The Silver Shackle is a manor house owned by Lerma the Easterner, a refugee from far L'p'nth. It is also a market dealing in only the finest quality slaves, drugs and luxury merchandise. Most Donarans consider The Silver Shackle a disreputable and almost criminal business, but it is popular with the nobility. NOTE - Lorna the Easterner is the known owner, but it actually owned by a three-member cartel: Zeirina Mavor, Shaikeir the Vendor and Urzal Kesh. Lorma is their employee and a front. Spinner is Bar is owned by Mavinius Arda and managed by his nephew Mal Jargas. Besides being a common tavern, it is Arda is land office for building rentals and rent collection. Mal is the major landlord in the Boil. The staff consists of Mal, his wife, three bartenders, seven serving wenches, two cooks and eight bouncers who also serve as collection agents when rent is past due. NOTE - Mal is totally dedicated to his wife, a Peska addict who, secretly, has had drug dealings with Lorma the Easterner. This park was founded in 999SA to celebrate Donara's final victory over Salaqi. The area contains grass, flowers, shrubs, trees and monuments to the soldiers who served in the Salaqi wars. To the Donarans, it is a holy place and a symbol of their greatness. The Salaqi have a much different attitude about it. A few of them have been executed for attempting to vandalize the monuments. This food market is run by Boran of Salaqara and his three sons. It sells food and drink, and its prices to Salaqi are reasonable on the high side. The prices that are charged to all others, especially Donarans are exorbitant: 2BB per food point for Salaqi, 6BB for all others. The food store is a front for selling contraband weapons to Salaqi criminals and revolutionaries. Boran is a leading member of the Sea Star Society and a major source of information for them. A two-story building with rooms for rent, its only business is to provide a home for travellers and citizens. It is a safe haven and has a manager, three maids and three guards. A full-time resident is Morar the Smith, who lives here in exchange for periodic ironwork, minor repair jobs, and acting as bouncer. A tavern often frequented by the guards at Prison Donya, it is a cheap inn that provides common fare and cheap beverages only. It is a place where the prison workers talk easily about their work (a prime source of information for criminals). The staff consists of the manager, a bartender, three wenches and bouncers. It is owned and managed by Girt Lian and makes very little profit. All prices are one-half those listed for a poor inn. The home of Urzal Kesh, the largest moneylender in Donara. The manor is an old building with three stories and is inhabited by Urzal, his mistress, four servants and twelve to guards. It is his bas eof operation, his treasury, and where The Silver Shackle Cartel meets. The home of Zeirina Mavor, master of Donara's Thieves Guild. It is a two-storey building with secret exits leading to the sewers, the city wall, and the Rathole. No illegal business is carried out in Manor Zeirina. All records and guild meeting take place at the Rathole. The occupants consist of Zeirina, her husband (a Donaran trader unaware of Zeirina's occupation) two maids and two guards. A poor tavern in the heart of the valley, it serves as a headquarters for her band of thugs, and the focus of her control of the Forgotten Valley. Marla is called the Queen of Forgotten Valley. She protects and controls most of the beggars, cutpurses and other disreputable people living here. Nothing happens in the valley that she does not soon become aware of. The clientele are friends and associates of people about to enter or be released from Prison Donya. It does a brisk business on execution days also. Its owner is a cantankerous man who spent 10 years in the prison. He hates jailers and does his best to help people who have imprisoned relatives. The inn never closes, and its owner works from 4 in the afternoon until midnight. The other staff are two managers, four wenches and one bouncer. NOTE - The owner is Filian Barca, 42-years-old. As a wild youth of 14, he threw a tomato at a passing noble and was caught. It turned out to be the Crown Prince (now Don XII), and Filian went in for life. He was freed after 10 years and set up in business by the present warden, Girt Lian. The warden faked Filian is death and smuggled him out. This walled area contains the main building and two barracks. The prison is a three story stone structure barely fit for human habitation. It is used to contain criminals whose crimes are serious enough to keep incarcerated but not serious enough to have them sent to Fortress Mordara. NOTE - If the king is especially cruel, some felons are kept here so that his majesty can see to their punishment peronally. A large one story tavern whose basement serves as the headquarters for the Thieves Guild. It is staffed by a manager, two bartenders, twelve wenches and four bouncers. Also, 3d6 guild members are present. All of the guild is secret business takes place in two basement levels below the tavern. Only common members are ever seen in the tavern proper. The Guildmaster (Zeirina Mavor) is never found anywhere except her Audience Hall. Roman's Emporium, in the front salon at least, deals in art, fine statuary and other objects of artistic value. Roman is personally renowned as being one of Donara's finest artists. He is also an unscrupulous man with a great love of gambling and danger. His emporium is a front for a large gambling den and a major center of smuggling activity in Donara. He often deals with Zeirina Mavor, refuses to have anything to do with Urzal Kesh, and is hated by as many criminals as he has dealings with. The Emporium is a two-story building staffed by Roman and four clerks. The clerks are competent fighters with a minimal knowledge of art. Everyone lives on the second floor. The Shattered Sword is a private club open only to people of Salaqi descent. Officially, it is a benevolent society that works to improve Salaqi/Donaran relations, and is tolerated by the crown, Actually, it is the base of a gang that rules the Salaqona quarter and an important meeting place for members of the Sea Star Society. The sword is a weather-beaten, three-story building that, from the outside, appears to be in terrible condition. It is staffed by a manager (Boran of Salaqara's cousin), two bartenders, four servants, and nine "accountants" who double as armed guards. A two-story structure standing on Palisar's main street, it provides fine clothing and luxury goods. Behind this respectable front, it provides any service or goods at a substantial price. Shaikeir is a Rogizini who provides quality at the highest he can get. He is also a source of information who has crossed swords of the Thieves Guild on more than one occasion. This makes the cartel somewhat unstable as Zeirina and Shaikeir despise each other. The emporium is staffed by Shaikier, three clerks and twelve guards. The Silken Bow is the largest, most expensive brothel in Donara. It is a three-story building staffed by its owner, two managers, twenty hostesses and eight armed guards. The average cost of a night's lodging is four gold coins, not including food or beverages. The Twisted Shade is owned by Marcus Kelvin, a noted scholar whose past history is unknown in Donara. The Shade is a one-story structure dealing in books and antique artifacts. Its basement is headquarters for a chaotic secret society dedicated to overthrowing Donara. This society has close ties to many important people, including Duke Salin of Pelara, and may even have contacts with Clima and other chaotic nations. The Wooden Axe is a small, one-room tavern that is commonly known as the Rabbit's Hole in this area. It is owned and operated by the 15 thugs who are in his gang. At any time, 2d6 of them will be here. There is also a 10% chance that the Rabbit will be here, wearing a professional disguise and unknown to anyone. NOTE - The Rabbit's most common disguises are an old man, a crippled soldier, a crusty old trader with one eye, and a crotchety old hag selling fortunes and charms. All are citizens often seen in the Run, and no one knows that they are one and the same person. The final section details some major characters in Donara. Boran is the representative of the Sea Star Society in Donara. The has lived his life as a peasant trader, dealing in foodstuffs and wool. Behind this facade, he has been a thief, assassin and mercenary. He is descended from the Salaqi counts who ruled this area before the Donarans. His goal is to destroy Donara's control of the region as part of a general rebellion based in Salaqara. Doing so will regain him his family lands and make him the Duke of Donara. He is aided by his three sons, ages 22, 19 and 15. The Donaran chapter has 23 active members. Girt is the fourth son of the Baron of Lianara in southwest Donara. From the age of 15, until he retired at 40, he served in the Royal Horse Guard, rising to the rank of Colonel. From his deathbed, Don XI gave him a life appointment as warden of Prison Donya. The has held that post ever since. Girt has an unusual attitude towards his men and the prisoners. He handles his men roughly and is a strict disciplinarian, but he also eases their lot on the sly, aiding them financially through what The calls windfalls of unbelievable good fortune, and providing them with the Gaoler's Retreat for relaxation. Girt personally reviews all details about each prisoner's case. If he believes that a prisoner is innocent, or his sentence was too harsh for the crime, the felon is cared for. If he decides that the punishment is just, or the too good for him, Girt is a cruel and vicious taskmaster. Girt is independently wealthy, strong-willed and just a little bit senile. Because of Don's boon, he cannot be removed until he dies or resigns. Horsch is the son of a Donaran sergeant serving in the Man garrison. His early life was spent in the company of soldiers moving from one Donaran fort to another. In this way, he acquired weapon knowledge and a taste for gambling. Horsch is a talented artist. He was disowned by his father for the triple crime of refusing to enter the army, becoming an artist, and running up a 13GC gambling debt. Since then, he has become a famous artist and a notorius figure in the Donaran underworld. He is a talented, conniving and intelligent compulsive gambler. Jobar is the Baronet of Nelsara and the Commander of the Royal Foot Guard. His life-long friendship with Don XII has made him a wealthy and prosperous man. He is known as a cruel, ambitious and greedY man. His personal goal is to use his imperial connections to improve his status, become Grand Marshal of the Donaran Army, and challenge a personal enemy, Duke Salin of Pelara, for the title of Donara's richest noble. He operates in Silver Lane, selling his unit's services for a great profit, and is among the most corruptible of Donara's senior officers. Lorma was born in L'p'nth, where he was a noted thief and brigand. But, he ran afoul of the Priestess of S'ph'nth after he stole treasures from her bedchamber, and fled the nation. After years of adventure, he settled in Donara, and made the acquantainence of Urzal Kesh. Together, they founded the Silver Shackle in 1092SA by pretending noble station and exhibiting obvious wealth. He is still supported by Urzal Kesh, Zeirina Mavor and Shaikeir the Vendor and, because he knows that Lorma is a criminal, pays blackmail to Jobar Nels. He is a devout hedonist, epicurean and scholar with very littic interest in physical activity. he is also a pragmatist, serving the owners of the Shackle because it is the easiest thing to do. Unknown to the citizens, Marcus is The Grandmaster of the Holy Order of Dark Vengeance, and an agent in the employ of Clima, He is a devious, deadly and educated man whose main concern is acquiring power. He plays the part of an ineffectual scholar. In fact, he is a talented wizard (MEL 9/EL 4 for all spells) who enjoys laying evil curses and banes on his enemies. Marla came to The Forgotten Valley 25 years ago to escape the lusty advances of a Donaran Count. She has since risen through guile, wealth and deadliness to mastery over the entire valley. Her total amorality in questions of personal survival, her wealth and her connections with the Assassins of Donara make her a dangerous enemy. NOTE - Marla is secretly married to the head of Donara's Assassins Guild, the furrier Shandor a'Chan. Mavinius was the son of a peasant miner in western Donara. In his early teens, he discovered a major deposit of gold and managed to convince the local nobility (the Garan family) to buy the knowledge from him with money rather than force. This stroke of luck began a career that has led him to the pinnacle of wealth and power. Morar is a veteran soldier who lost his left arm and eye in battle. He is a blacksmith, aided by his 9-year-old son. He is very skilled with a hammer, in forging and fighting. Morar is known in Maulton for his fairness, gruff manners and violent temper. They respect these qualities and like Morar. None will cross him for any reason, and believe him to be the strongest man in the world. He has a +4 SB with a Strength of at least 80. Ghirand is a beggar and herb seller in the Crossroad streets. He has a reputation as a healer and is thought to be a great wizard by the peasants. Both of Ghirand's legs are paralyzed; he moves on a wheeled platform, pushing himself along with his hands. He is an exceptional healer (EL 12) a master herbalist (EL 80) and has no talent in magic. Ghirand is a cunning old man. He is one of the most respected citizens in Crossroads. An attack on him will invite immediate retaliation. The last thief was beaten to death before the guard could arrive to save him. The Rabbit is the most mysterious figure in Donara. For the past 13 years, he has stolen from more than 50 wealthy households including the Royal Palace, As a free-lance thief, he is hunted by the legal authorities and the Thieves Guild. The Rabbit's greatest strength is that no one knows who he is. None of his associates have seen his face or know any other name. He is a supremely competent thief (EL 80), a master jeweler (EL 80) and a competent warrior (EL11 Hand-to-hand, EL 12 throwing and fighting with daggers). NOTE - The Rabbit's secret identity is Baron Marlan Peran, Sword Captain of Her Majesties Horse Guard. He is not suspected of leading the Rabbit's gang. Shaikeir is a businessman who was born in the Rogizini city, of Acghiza. His parents were servants of Acghiza's Emir. lie began his life training in the family tradition. When he was 16, his father was framed for a theft from the Emir and killed, and his mother and he were forced to flee the empire. Shaikeir found his way to Pelara, where he opened his first Emporium under his direction. Initially successful, he ran afoul of Pelara's powerful Thieves Guild and was forced out of business to save his life and remaining fortune. He moved north and settled in the capital in 1091SA. Since then, he has developed strong connections and rebuilt his business. His mother remains his chief adviser and accountant. (She is 59, hard-bitten, and shrewish with a great deal of anger towards the world). Except where it concerns his family, Shaikeir is an amoral man with no concern for others. He is dedicated to his mother and will do anything to protect her. Shandor a'Chan is the furrier to the elite. His shop is located in Donara's cast market and has been a member of the Furrier's Guild for more than 35 years. His reputation as an upright and unassailable citizen is beyond reproach. Beneath his facade, Shandor is the master of Donara's most powerful guild: the 40-member Assassins. They strive for total anonymity. They do not have a single secret meeting house, but 10-15 safe houses located around the city. They are known to each other by secret signals and a brand that all wear on the back of their left shoulder. No assassin knows more than two other assassins except for the ruling five. Shandor is a brilliant man with a great organizational ability. His reign as Guildmaster, beginning in 1083SA, is responsible for the guild's power. He is he lynchpin holding it together. NOTE - Shandor is out of condition as an. assassin. He has not personally killed anyone for more then eight years. If he is attacked, treat him as an EL 8 assassin with at least EL 6 in any weapon that he uses. At his height, his EL was 13 and his minimum weapon EL was 9. Urzal is a small rotund man who is Donara's most prosperous and unscrupulous moneylender. He employs a large group of thugs to serve his collection needs and provide him with other sources of income. His primary source of pleasure in life is money. Were he to be given all of the gold in the world, he would try to figure out how to get the silver, copper and brass. Greed is the single dominant facet of his personality. Urzal will do anything to advance himself regardless of of its effect on others. He is a cold, heartless moneylender totally unconcerned with morality or fairness. The leadership of Donara's Thieves Guild is, and has always been, hereditary. Zeirina took over after the death of her father three years ago. Under her, the guild has begun to expand its influence into Shaded Valley and other areas. Two years ago, one of her thieves robbed the Silver Shackle and discovered that Shaikeir the Vender and Urzal Kesh were its owners. She used this information to make herself the third partner. Her goal for the guild is to triple its size before passing it on to her 7-year-old son. Zeirina leads a dual life. Her husband is an itenerant trader were travels a great deal (20% chance the is home). He is completety honest and devoted to Zeirina and would probably kill her if he found out. NOTE - Zeirina met her husband when she was working at the Silken Bow. He believes that he saved her from a life of degradation. She doesn't disabuse him of that notion. Zeirina worked at the Bow because her father thought it best that she learn the streets from the bottom. He had forced her to work as a beggar, street thief and con artist also. NOTE - The map above is scaled to 40% of its original size.